Blue is the first fully-fledged new production for young theatre company, Chippy Lane Productions. It’s a classic premise: a very domestic drama set in one living room, with the arrival of a figure from the past forcing a family to confront its secrets and an unspoken grief. Elin (Sophie Melville) brings home an old teacher, Thomas (Jordan Bernarde), when they are interrupted by the unexpected presence of the rest of Elin’s family, her neurotic mother (Nia Roberts) and socially challenged brother Huw (Gwydion Rhys). 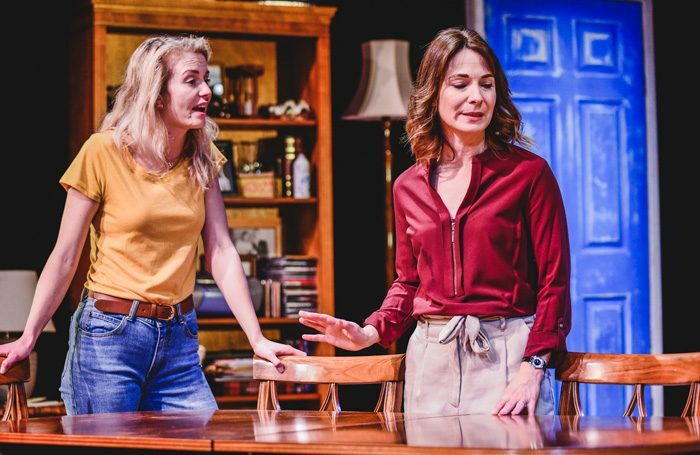 To Chippy Lane’s credit, the cast is first-rate (Melville and Roberts, especially, have delivered two of Welsh theatre’s finest recent performances, for Iphigenia in Splott and Love Steals Us From Loneliness respectively) and they do what they can with the material here. Oliver Harman’s decaying set and Tic Ashfield’s soundscape hint at a dark, brooding tale – and, in parts, it is. Yet much of Blue plays like a drawing room farce, from the awkward mid-coitus interruption through to an utterly improbable misunderstanding about Thomas’s sexuality and his motives for being there. Rhys Warrington’s play seems stuck between two or even more stools, with too much crowbarred into what feels like a long 90 minutes. While threads of story are lost entirely, others are clunky and the ending feels borrowed from a syrupy afternoon TV movie. The cast remains watchable but even they cannot work miracles in a play that doesn’t seem to know what it wants to be.